Blurb: The TARDIS has brought the Doctor back to Revolutionary France, a place that's always fascinated him. But this time he, along with Steven and Vicki, are drawn into a devastated land, caught between the soldiers who are burning all before them and a monstrous shape that follows in their wake. Format: Limited-cast audio drama, a Companion Chronicle from the point-of-view of Vicki Pallister. Published by Big Finish Productions and released June of 2017. Setting: Earth: Vendée, France in December 1793. Vicki narrates the story at an unknown time afterwards. Continuity: This story takes place between "The Time Meddler" and "Galaxy Four". There's no indication of when it takes place with regard to other stories set in the same gap although it appears to be somewhat early in Steven's time with the Doctor. The Doctor mentions that the TARDIS remembers having been in this time before and he mentions having met Robespierre (see The Reign of Terror). Vicki mentions her medical skills (see The Web Planet). Steven mentions that he's seen war (see The Chase, Return of the Rocket Men, and The Anachronauts). Vicki mentions that the members of the Infernal Brigade are like Daleks or Mechanoids (see The Chase). Discussion: The Companion Chronicles are back with a new set of stories from the first Doctor's era. The initial story tells of a time when the Doctor, Vicki, and Steven visited France during the revolution. Unlike the television story, "The Reign of Terror", they're in the thick of the fighting, and the TARDIS crew gets to see human nature at its absolute worst. It's a nice setting for the story, creating a lot of potential peril and drama for the characters. The problem is that this story really squanders the potential of being a Companion Chronicle. When The Companion Chronicles stopped being a monthly range and The Early Adventures started it seemed like a great way to create a demarcation between the two formats. The Early Adventures would be story focused while The Companion Chronicles would be character focused. After all, the best Companion Chronicles always were the character focused ones. 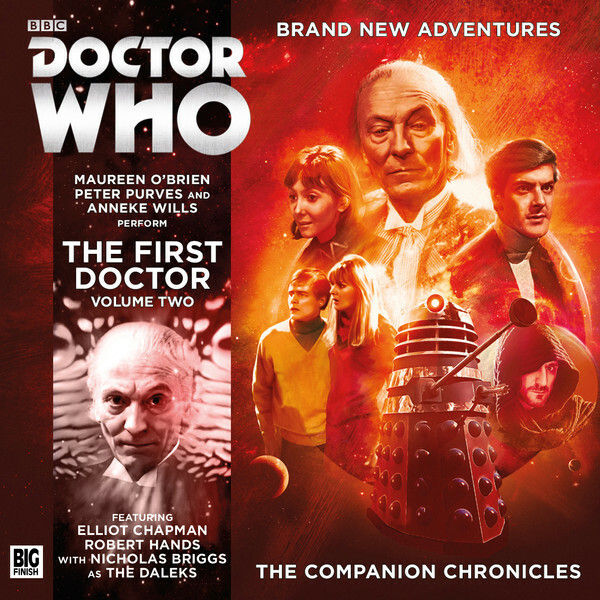 The existence of The Early Adventures could weed out the straight adventure stories that were just being told in the Companion Chronicle format because that's all that there was first the first two Doctors at the time. The issue is that Vicki and Steven pretty much do nothing in this story. Yes, Vicki does have an insight or two that gives us a bit of insight into her character. Yes, the "monster" attacks Vicki so that there's an episode cliffhanger, but Vicki really doesn't do much and doesn't grow or change as a result of the story. There are no special insights that get us to understand Vicki better. This is basically just a regular adventure that wouldn't have been out of place as an Early Adventure. There's nothing wrong with that, but I think it's a waste for this range when we only get four stories per year to do this kind of story. Storywise things are a bit better. There's a real darkness to this tale that deals with a bloody and dark time in history. Lagrange is a product of his era, a man that believes that he can do no wrong in the service of his cause and is all the scarier for his sincerity. It's difficult to listen to the matter-of-fact way that he talks about murdering an entire hospital full of people as punishment for aiding the outlaws that they pursued. I was rolling my eyes at the thought of the "monster" running around 18th century fan. I prefer pure historicals for Hartnell, which is why I was pleasantly surprised when the story took a "Scooby-Doo" turn, and it was just a man after all. I think in many ways that made the story a bit darker with the idea of the inhumanity of the "internal column" inspiring others to acts of inhuman rage and barbarity. If I were to take issue with any element of this it's that it's clear that Pritchard wanted to go in a different direction and instead of revising the earlier parts of the story to match the new direction it suddenly becomes obvious that the man is just a man. No explanation is given for the glowing red eyes, and I find it hard to believe that Vicki from the 25th century would believe that monsters lurked in 18th century France that science never discovered. It makes for some difficult listening, so I wish that the cries of "monster" would have been limited to the people of the time and that Vicki might have suggested that it could be an alien. My only other question is why Nicole is in the story at all. Lagrange could have come upon an empty house for all that Nicole adds to the story. I kept thinking that she was going to know the murderer somehow, but she doesn't. I don't really understand what the point was. Characterwise, it's really a story about the Doctor and Lagrange. Vicki and Seven are merely set-dressing. I've already mentioned how little Vicki gets to do and its even worse for Steven. He comes to Vicki's assistance at one point, so they're both going to get shot but otherwise he's a complete background character that only gets the odd line here and there to remind us that he's present. All of his normal brashness and sarcasm are absent. It not only feels false, but it's a disservice to the character that has been so well fleshed out in other stories. The Doctor, though, waxes poetic and philosophical throughout the story. Pritchard doesn't seem comfortable dealing with the first Doctor. He doesn't resemble the man on TV, but his verbal sparring with Lagrange and the way that he stands up to the soldiers who are about to shoot the wounded royalist definitely speaks to the courage of the character. His incorrigible name-dropping of Robespierre was very first Doctorish, though, and I absolutely loved how he tried to ingratiate himself into Lagrange's good graces and talk him out of needing to see his papers. The real exceptional character, though, is Lagrange. The man is ice cold. His utter, ruthless certainty makes him terrifying. The fact that he's intelligent makes it worse. He gives as good as he gets in his verbal sparring with the Doctor, and the way that he's able to justify the horrific acts that he perpetrates makes him both compelling and awful. The acting is a bit of a mixed bag. I love it when O'Brien performs as Vicki. She's very good at aging herself down, and I feel like her Vicki comes through as very authentic. The issue is that she can't do anyone else at all. I almost cringed when she performed as The Doctor. I feel like O'Brien does the worst job with his character. It just doesn't sound like him. He wasn't so reedy. He was authoritative and gruff. Ford gets it. Even though she doesn't sound a bit like Hartnell, Ford can get the style and mannerisms correct. Even worse is O'Brien's Steven who sounds like the most generic voice that she could create. You'd think after working with him in recent years she could imitate him a little better than that. Thankfully, O'Brien doesn't have to say much in other male voices. Her Nicole is good and you can tell that O'Brien is living in France because the accent is superb. I just wish that she could put as much effort into recreating her costars. Conversely, Robert Hands is nothing short of excellent as Lagrange. He gives the character the larger-than-life aspect that he needs, and he definitely delivers on the conviction. Much of Lagrange's likability comes from Lagrange's charismatic performance, and it just about makes me hope that through some contrivance we can see Lagrange again because he's a fantastic villain. As for the production, Big Finish does their normal fantastic job. I love the expanded extras on this CD that gives the point-of-view of just about everyone involved in making this story. One of the things that really comes through in the sound design is how much they think through the music. The muffled piano sounds do create a creepy tension throughout the story and help to give it that lonely winter evening feel. I also enjoyed the sound design. As usual, Big Finish makes you feel like you're actually there, and I really enjoy the effort they put into making these productions great. Recommendation: It's an odd story. There's so much wrong with the characterization and the performance for Steven and the Doctor that I had a kneejerk reaction to it, but at the same time I really enjoyed the story that it told, the twist, and especially the character and performance of Lagrange. It's an uneven story and production, but I think that the positives outweigh the negatives. I recommend giving it a listen.